This is a work-in-progress. 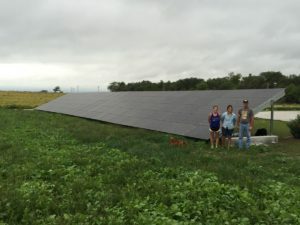 If you’ve installed solar on your Nebraska home, business, or nonprofit and would like to include your project in this resource, please send a brief description, one or two photos, and (optional) any links to news stories or announcements about it to Helen Deffenbacher: nebraskansforsolar@gmail.com. To view additional solar examples, visit the websites of the installers / developers who have listed their businesses in our directory. 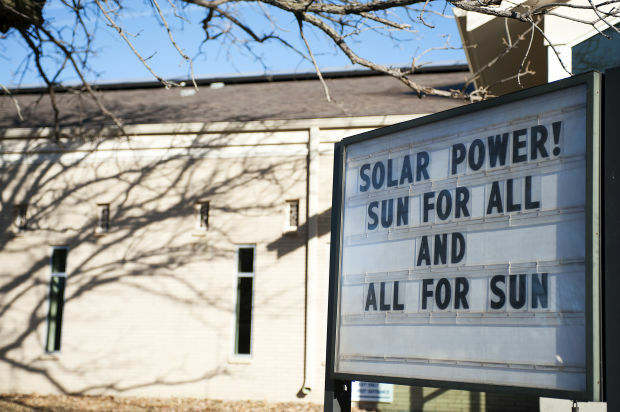 Click on the following link to view photographs, discover resources, and read news stories about local and national examples of Community-Scale Solar. 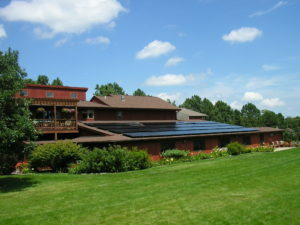 This 14-kilowatt solar array serves two purposes. 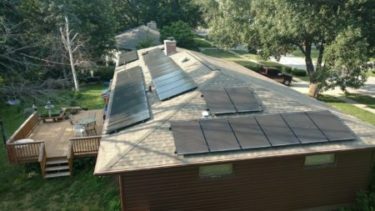 Not only does it offset the homeowners’ electrical usage from day to day, but also it maintains a battery system for when the utility grid goes down. If the home does lose power, the battery system will automatically power the whole home indefinitely. 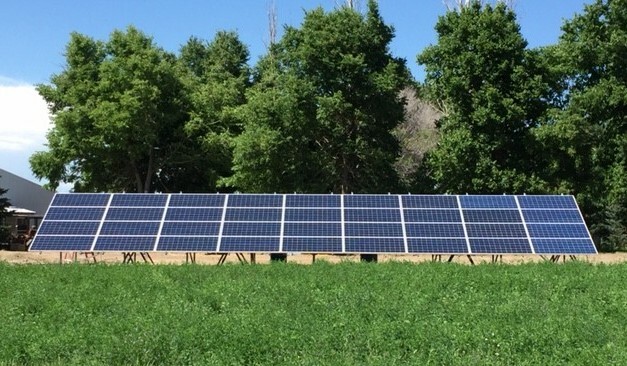 Project: Two solar arbors (10.6 kilowatts or 40 modules) in Hartington, generating $110-$120/month of renewable energy and providing a shady place for warm-weather picnics, visiting with neighbors or reading. Over the lifespan of the solar systems, which typically last 25 years, that adds up to $33,000 to $36,000 in today’s energy dollars. The metal frames, or racking systems, are made in Nebraska by Knopik Engineering. 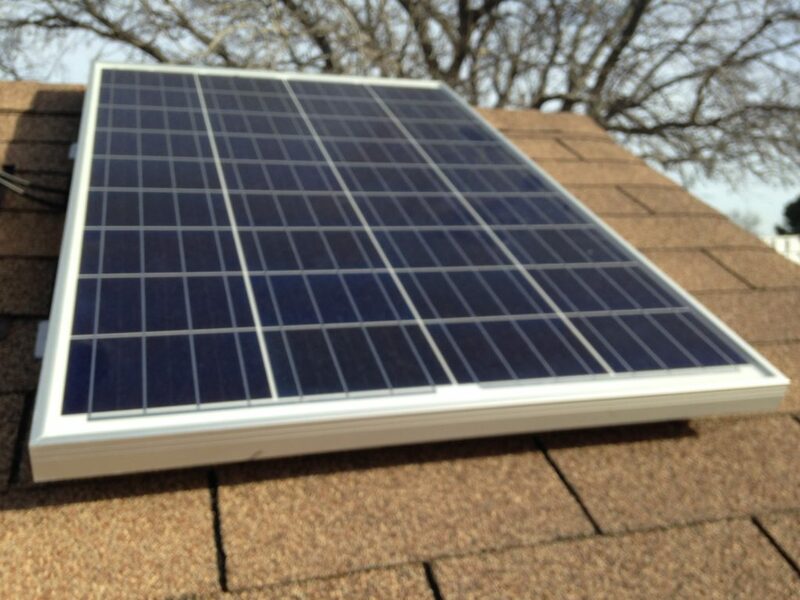 Project: 3-kilowatt installation, with 8 south-facing panels on the side of the house and 4 on the roof. The system offsets their home’s power use during the day and charges their plug-in Chevrolet Volt every night, which is then driven on battery for pennies a mile the next day. Project: 538-kilowatt DC solar system built next to the wastewater treatment plant. 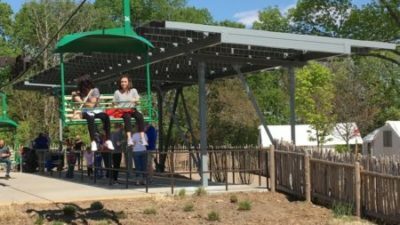 The project is the first of its kind to use NPPD’s solar rider. 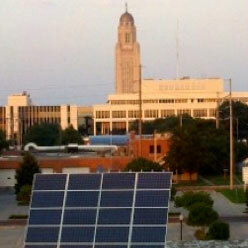 Project: 7-kilowatt grid-tied installation on Bellevue’s Public Safety Building, 1510 Wall Street, Bellevue, Nebraska. 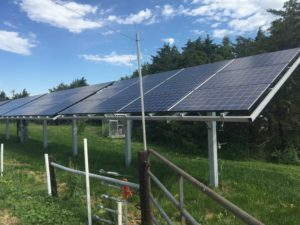 Project: 650-kilowatt array on the Blakeman Ranch in Custer County. Project: Three proposals were offered for the home with varying degrees of energy savings. Bob and Gina decided to go with the largest system, designed to provide 11% more energy than they actually use. The more power they conserve, the more they send back to the grid. Gina tracks the system’s performance using her I-phone. Every panel is monitored individually to provide easy diagnostics. It also keeps track of daily, monthly, yearly and lifetime system output. 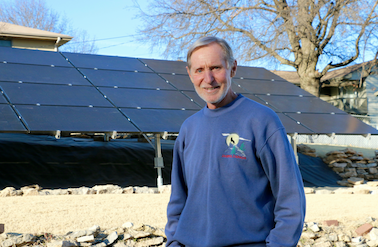 Project: 10-kilowatt solar system, which powers half of Greg Brummond’s corn and soybean farm. Project: The solar system was installed on the back, south-facing side of the school garden’s toolshed. 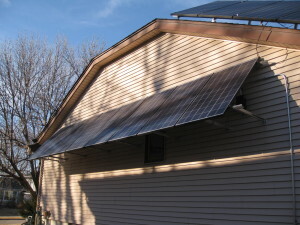 The system is the Grape Solar 100-Watt Basic Off-Grid Solar Panel Kit ordered from Home Depot. It serves a practical as well as an educational purpose, providing a power source for garden tools and electronic devices. 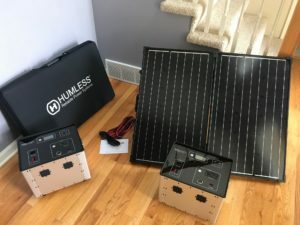 The Grape Solar Kit includes a 100-watt polycrystalline solar panel, a 165-watt charge controller with USB outputs and DC load control, Grape Solar Zip pity feet, cables and manual. The kit is easy to install and virtually maintenance free. 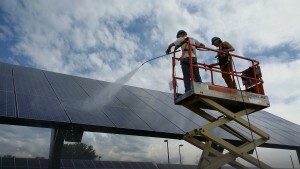 As with all systems, the solar panel will need occasional cleaning. Project: 500-kilowatt solar array installed on an abandoned parking lot in Central City. Developer Cliff Mesner worked with several other local businesses and the city-owned utility to develop the project. Dixon Power Systems is proud to introduce the Charge ‘N Go, a portable charging station for mobile devices. 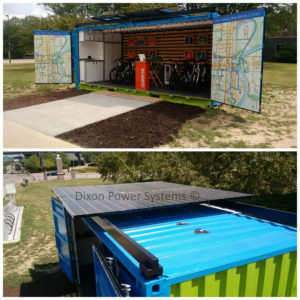 The Charge ‘N Go is a custom design by Dixon Power Systems and provides charging capabilities where the utility grid is not available or inaccessible. It’s perfect for outdoor events, college & university campuses, corporate campus, high schools, even camp grounds. The design consists of one 310-watt bi-facial solar panel, a 12-volt battery system for 24 hour operation, and 6 intelligent device recognition USB ports for up to 4.8 amps to charge devices as fast as possible. Available for purchase or rental. 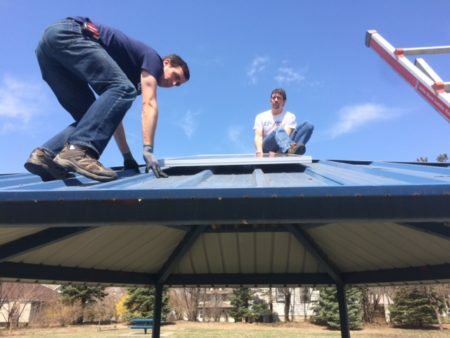 Nebraskans for Solar and the Joslyn Castle Neighborhood Association partnered to bring solar to Clarkson Park in Omaha on Earth Day 2018. 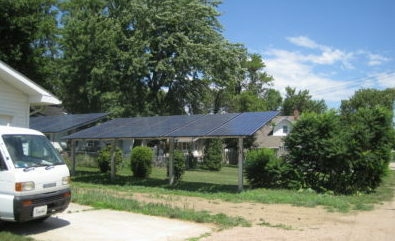 Located at 124 North 42nd Street, Clarkson is now the first Omaha city park to be equipped with solar panels. Funding for the project was provided by a grant awarded to the Joslyn Castle Neighborhood Association (JCNA) through the Mayor’s Neighborhood Grant Program. 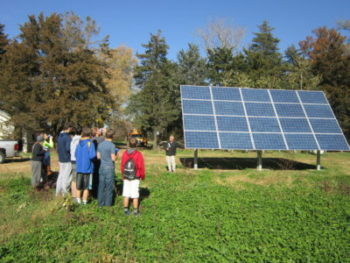 Nebraskans for Solar donated the panels, and volunteers, led by Eric and Scott Williams, installed them. 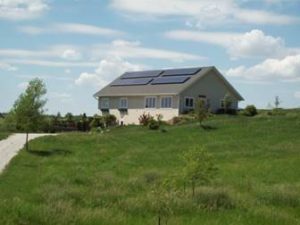 Project: Grid-tied 5.4-kilowatt PV system in rural Scotts Bluff County, Nebraska, which generates enough to about “break even” in overall consumption/generation for this year-round home (electric heat supplemented by wood stove). 20 x 260/270w panels tied to Enphase M250 micro-inverters/Enphase Envoy gateway. Roof-mounted about 25degrees east due south using basic and inexpensive Unistrut framing, bolted to E mounts by Quick Mount PV, which were installed during replacement of the old roof with a new composite roof. Production/consumption monitoring using SiteSage for Homes/Powerhouse Dynamics. 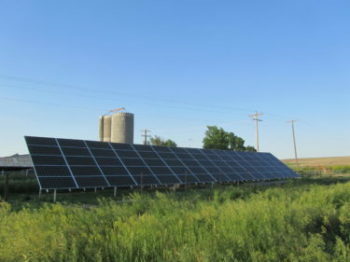 Project: 20-kilowatt solar system in the Norris Public Power District. A combination of systems was proposed to greatly reduce the load. The owner decided to install the photovoltaic system first, offsetting a significant amount of the energy load. A thermal solar application would help heat the pool and hot water for the locker rooms. The thermal solar application is planned for 2017. The PV and thermal solar systems combined would have a payback of less than seven years. The monitoring for the PV system is waiting on a wireless internet provider for the area. Once this connection is made, the owner will be able to monitor the system online. Project: 85-kilowatt solar canopy on the Cuming Street parking lot. 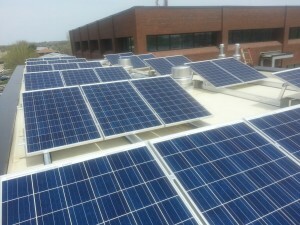 A second installation, a 20.5 kW south-facing solar system is atop the Kiewit Fitness Center. This custom designed canopy by Dixon Power Systems features glass on glass bi-facial solar modules allowing sunlight to pass through individual solar cells, harvesting sunlight on both sides. Integrated into the homeowners’ deck, the canopy provides shade similar to standing under a tree. 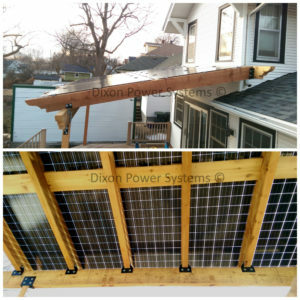 The structure is made from cedar with steel brackets that are also custom designed and built by Dixon Power Systems. Geothermal fresh air system – 160 feet of buried tube with automated fan/valve system providing fresh air, humidity control, and 55 – 65 degree air year-round reducing heating/cooling needs (This means no traditional air conditioning system is ever needed). Darren Dageforde is the Executive Director of Utilities & Energy Utilization at the University of Nebraska Medical Center. 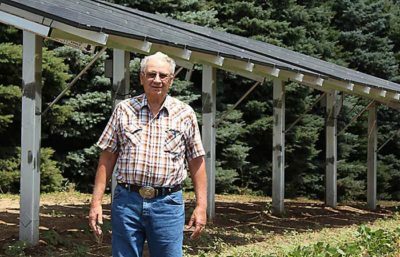 Project: 10.4-kilowatt net-metered photovoltaic system that provides the owners, Marvin and Debra DeBlauw, 75-80% of their farm’s energy needs. 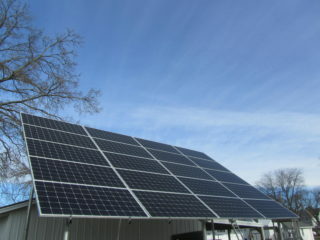 Project: 25-kilowatt solar system (96 panels) with 3-phase, seasonally-adjustable, custom-built frames. 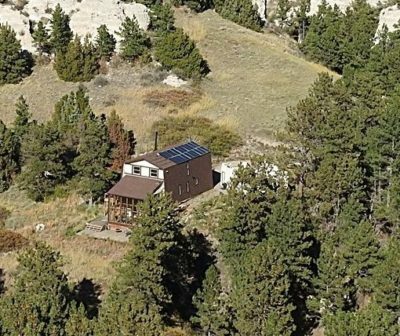 Project: 8.4-kilowatt, grid-tied, OPPD net-metered system, ground mounted on south-facing slope with no battery storage (yet) and 28 optimizers. Installation was completed in December 2016, with enough capacity for all electrical needs in an all-electric residence of 2000 sq. ft. with a geothermal heat pump. There is extra capacity for a future electric vehicle. Project: 24.8-kilowatt ground-mounted solar array consisting of eighty 310-watt solar panels. Underground conductors send power to the meter cabinet attached to the building. 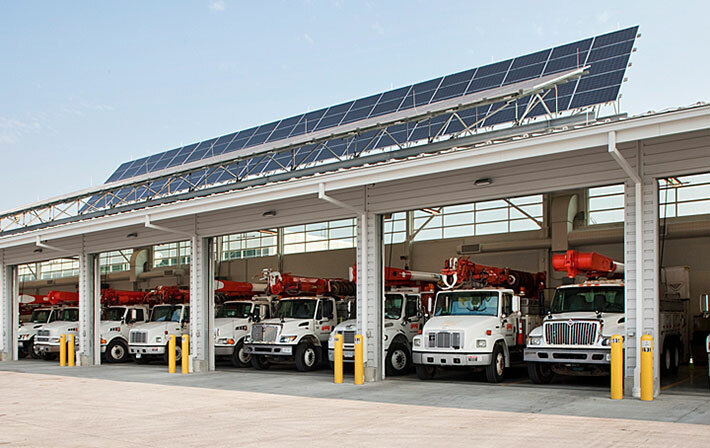 Lincoln Electric System provided Dual Dynamics an incentive for the south-facing system in the amount of $9,300 ($375 x 24.8kW) as a capacity payment, as soon as the project was commissioned. The estimated payback is within ten years. This portable environmental trailer is used for ground water remediation, in this case removing diesel fuel spills from ground water. The portable design allows for easy transport from site to site. The trailer features collapsible solar modules for transport and out-riggers to stabilize trailer on uneven terrain and in high winds. 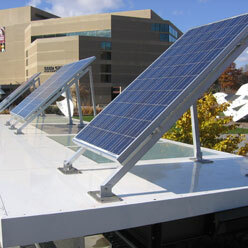 The solar array charges a battery system which powers an air compressor for the pneumatic pumps. 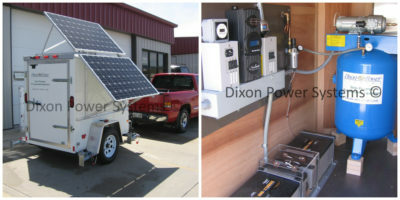 Designed and built by Dixon Power Systems, this portable trailer is truly one-of-a-kind. 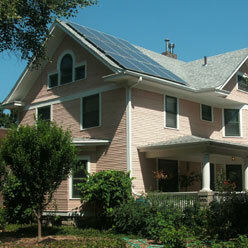 Project: 3-kilowatt, south-facing PV system provides clean electricity for their Dundee home and electric car. 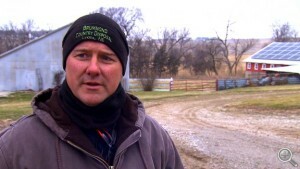 Eric, Past President of Nebraskans for Solar, provides tours of his residential solar project. Installers: Mainly a do-it-yourself project by Eric and Scott Williams and Nebraskans for Solar volunteers, with Michael Shonka of Solar Heat & Electric providing technical advice & assistance. 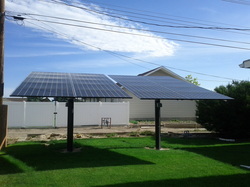 Project: 10-kilowatt solar array just outside the small Village of Craig, Nebraska installed by GC Resolve. 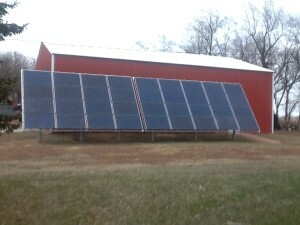 This array provides about half the farm’s energy needs. The project was partly funded by a USDA Rural Energy for America (REAP) grant, covering 25% of its cost. 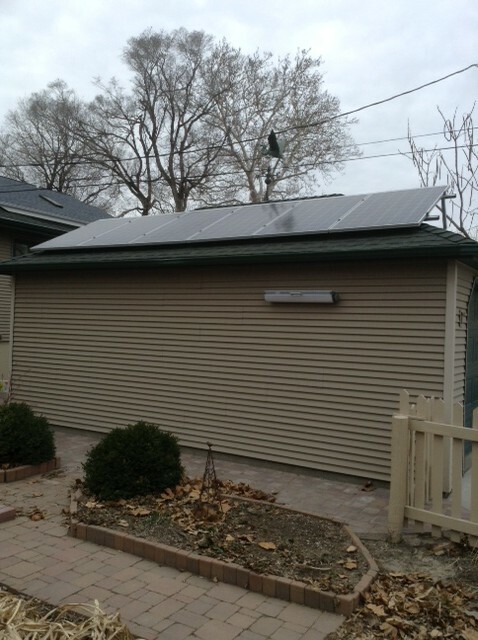 Project: 21-kilowatt solar system in Minden, Nebraska installed by GC Resolve. This array provides most of the farm’s energy needs. The project was partly funded by a USDA Rural Energy for America (REAP) grant, which covered 25% of its cost. 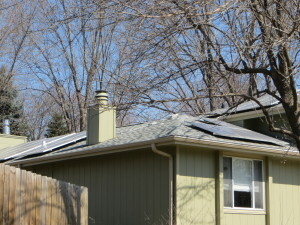 Additional financing was obtained through the Nebraska Energy Office’s low-interest loan program for solar installations. Project: 1.55-megawatt solar farm located off Jack Sutton drive near the city’s power plant. 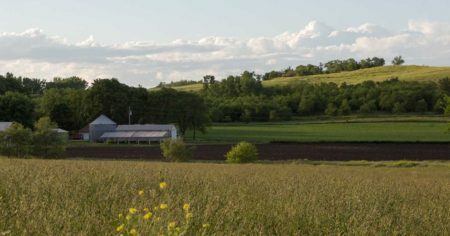 The farm’s two hundred subscribers had the option of either purchasing solar panels or a share of the farm’s energy generation. 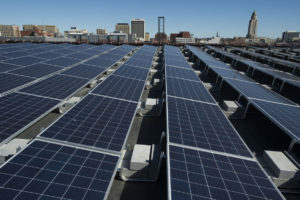 The city completed a second solar farm of the same size in September 2018 to accommodate strong customer demand. 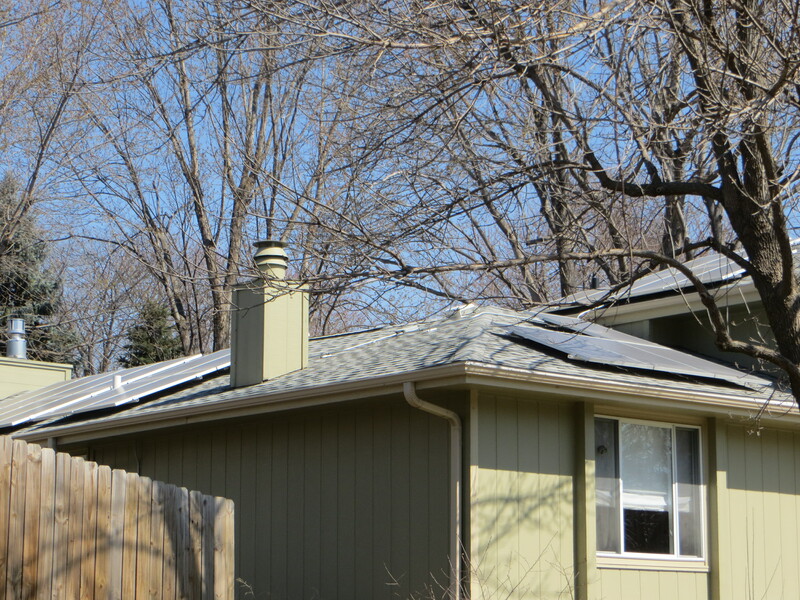 Project: Nebraskans for Solar and Habitat for Humanity of Omaha installed this solar hot water system (equivalent to a 3-kW photovoltaic system or twelve 250-watt solar panels) on a South Omaha Habitat for Humanity home in August 2014. 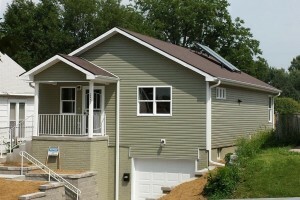 This was one of four demonstration houses in our Solar Powering Low-Income Housing Program. 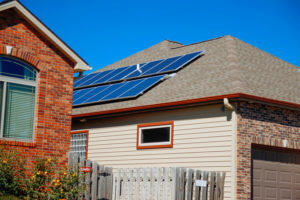 In evaluating this model program, and from discussions with Habitat for Humanity of Omaha and other nonprofit leaders, Nebraskans for Solar made the decision to create a second program option, the Solar Trainee & Mentorship Program. 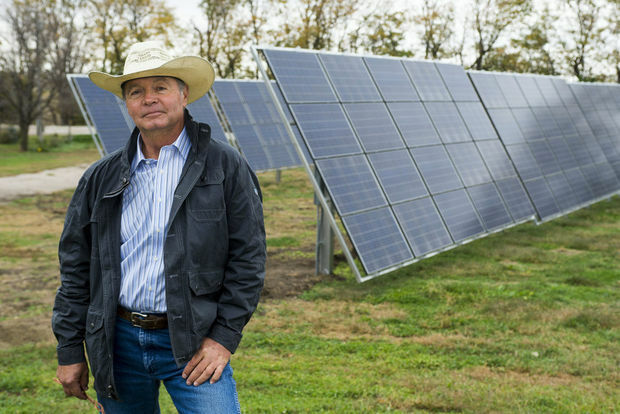 Project: 25-kilowatt photovoltaic system powers the Hammond farm operation west of Benedict. 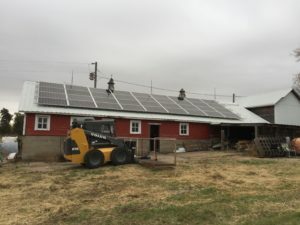 The project estimate was $84,864; however, a USDA grant and federal tax credits reduced the cost to only $19,100, with a payback of just over 6 years, after which the farm will benefit from free energy. 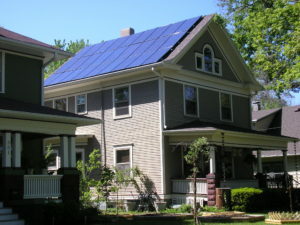 Solar panels typically last 25 or more years. Project: 25-kilowatt solar system. USDA Rural Energy for America Program (REAP) grant award winner. The solid red line is the amount of power being used. 1. The red area is the energy (power over a period of time) that is being drawn in from the grid. 2. Clear area under the red line is energy that is being “self-consumed” or generated by solar and used on-site. 3. The green line is solar power production. 4. The green area is energy that is exported into the grid. 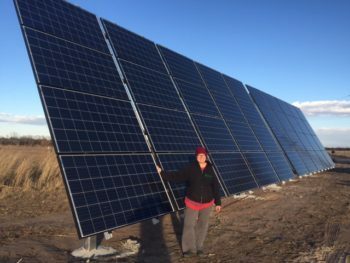 By Sam Burrish, Communications Manager, Ho-Chunk, Inc.
A community-scale renewable energy effort in the northeast Nebraska community of Winnebago is creating one of the largest renewable energy infrastructures in the state. 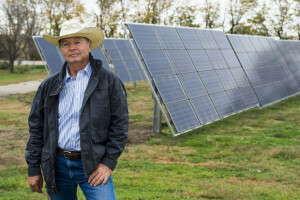 A solar panel farm is among 14 renewable energy projects recently completed, part of a $700,000 total investment in renewable energy with the support of U.S. Department of Energy grants. Ho-Chunk, Inc.’s mission is to drive the socio-economic development of the Winnebago people through a world-class tribally-owned company. Their award-winning business model reinvests in the Tribe through programs including employment, housing, education and health. Located in northeast Nebraska, Winnebago has a tribal membership of 5,300. 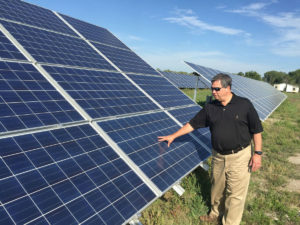 Images Courtesy of Sam Burrish: Robert Byrnes, owner of Nebraska Renewable Energy Systems, whose business installed the solar energy projects, including the Winnebago Tribe’s Solar Farm on the north end of the community. 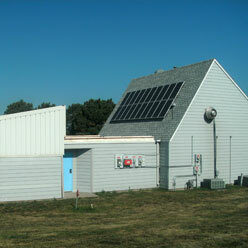 Project: 2.2-kilowatt photovoltaic system installed in 2003 as a demonstration project by Lincoln Electric System, Hyde Observatory Board, Lincoln Parks and Recreation, Information Analytics Incorporated, and Alltel. According to a 2008, five-year study, the system has generated nearly 40% of the observatory’s electricity needs. Project: 10.6-kilowatt photovoltaic array, with south- and west-facing solar panels. Both their heating and cooling systems are electric. Project: 4-kilowatt photovoltaic system. 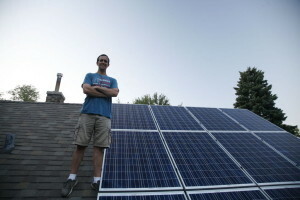 Jason, owner of J-Tech Solar, plans to add more modules next year. 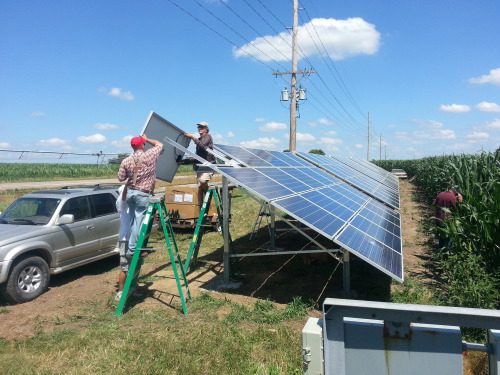 Project: 25-kilowatt system funded, in part, by a USDA Rural Energy for America Program (REAP) grant. The solar array consists of one hundred 225-watt solar panels. The energy it will generate is estimated to replace 112% of the Jenkins’ yearly usage. The ranch has been in their family since 1876. 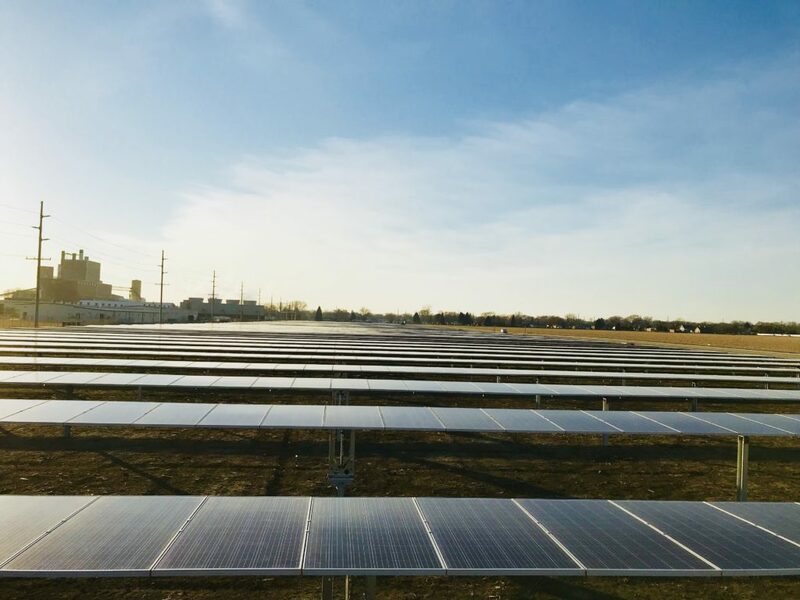 Project: Kearney’s solar farm consists of approximately 23,000 panels on 53 acres located in the city’s technology park, Tech oNE Crossing, The panels are mounted on a tracker-designed racking system. To date, the array is Nebraska’s largest solar project, generating 5.8 megawatts of electricity, or about 5% of Kearney’s peak demand. Kearney NPPD customers can purchase shares here. 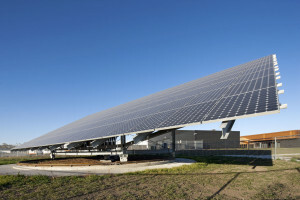 Project: 11-kilowatt system consisting of thirty-six 305-watt panels. The farm also has a passive solar cabin with a trombe wall and an active water unit with 550 gallons on storage. Project: 25-kilowatt photovoltaic system. All US-made products. Six-year payoff at current electric bill. No upfront-cost, low-interest rate loan (2%) for up to 10 years. 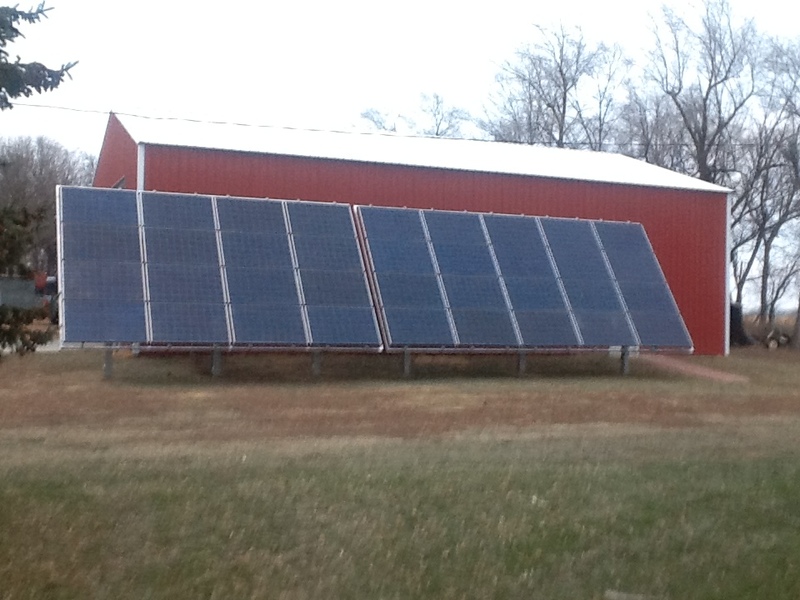 Project: 10-kilowatt solar system with 3-phase, seasonally-adjustable, custom-made frames. Project: 25-kilowatt system. All US-manufactured products. 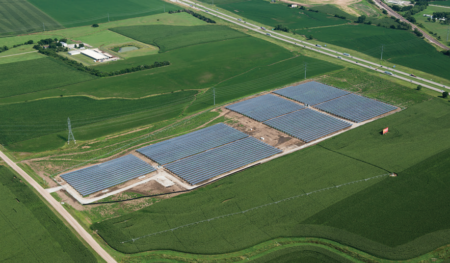 Generating 5 megawatts of solar energy, the LES community solar facility is currently Nebraska’s largest and first utility-scale solar installation. 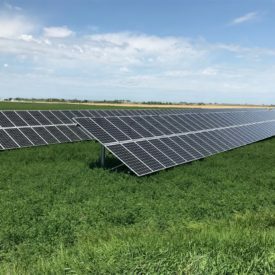 The solar farm is located on a portion of a 46-acre site near Northwest 75th and Holdrege Streets. 1) SunShares: By adding a donation to their monthly bill, LES customers help support solar energy in the Lincoln area. 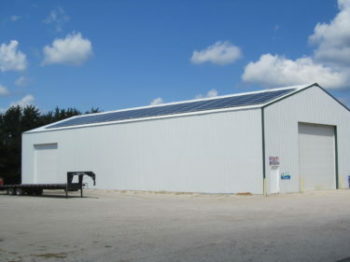 Each SunShare is $1 per month; a three-share ($3) minimum is required. 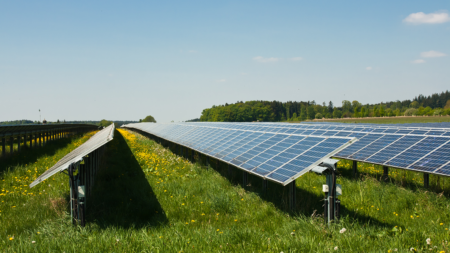 2) Virtual Net Metering Program: LES customers can invest in “virtual” solar panels representing a portion of the community solar facility’s output. Each virtual panel requires a one-time $685 enrollment fee that results in a credit on the customer’s bill each month. This credit correlates to the level of investment and the actual energy production of the solar facility. 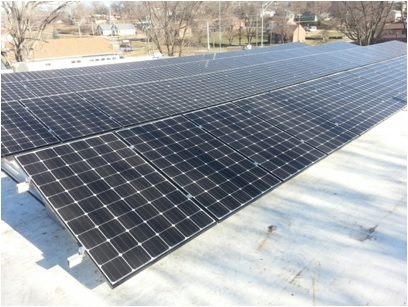 Project: Lincoln Electric System added 50 kilowatts of solar energy through a rooftop solar array commissioned in early December 2014 on the LES Walter A. Canney Service Center at 27th and Fairfield Streets in north Lincoln. 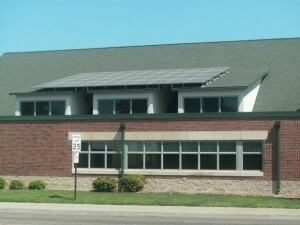 Project: 10-kilowatt photovoltaic system (40 solar panels) installed in June 2013 on one of Lincoln’s most energy-efficient buildings, with geothermal heating and cooling. The array faces south, on 27th and Holdrege Streets. 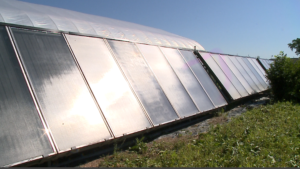 The solar panels heat a 700-gallon water tank that powers a propagating bench for the farm’s aronia berry plants. 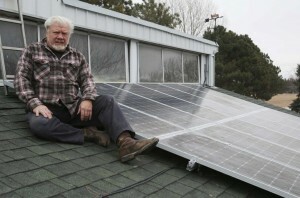 Owner, Tom Lundahl, received a grant to purchase the used solar panels. Metropolitan Utilities District has 200 gas pressure recording charts located throughout its territory. 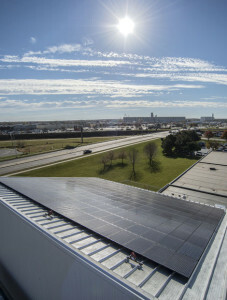 In 2017, the District completed the installation of a solar-powered chart-reading system that automatically transmits the necessary data to headquarters. The District will annually save the time and mileage formerly expended and will save 49.6 metric tons of carbon dioxide from emitting into the atmosphere. Project: 27-kilowatt Photovoltaic System Expansion on Morrissey Engineering’s LEED Platinum Building, 4940 North 118th Street in Omaha. 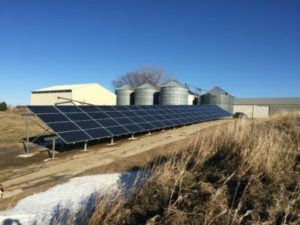 Project: 390-kilowatt solar array installed near Cozad, Nebraska. There are 1224 solar panels producing energy supplied to Dawson Power. Project: Residential 5-kilowatt photovoltaic system, which generates enough electricity to make the home a net-zero energy house. Project: 8.6-kilowatt system that will result in net-zero energy consumption during OPPD’s most expensive summer months of June-September. 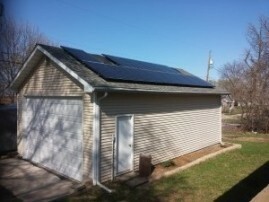 Panels were installed on a curved, standing- seam metal roof. 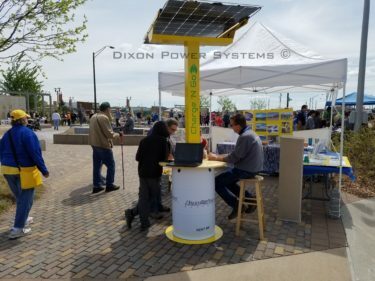 Nebraskans for Solar is always looking for ways to bring clean and reliable solar energy to events and to those interested in learning more about renewable energy in general. With special support from the Omaha Venture Group, we now have tools to store solar energy in a battery and convert it back to standard plug power to provide usable solar energy day or night, indoors or out. If you could use a solar battery-generator for an educational session, are interested in using a solar battery-generator at a sustainability-related event, or have other questions – we want to hear from you! Please contact us for more information. Photo: Paired with the two new Humless Go Mini battery-generators are two foldable 130-watt portable solar panels. A full battery-generator charge from empty can be completed in 2.5-4 hours with these solar panels. 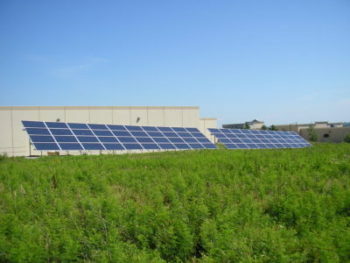 Project: 45.6-kilowatt photovoltaic array (147 panels) at NPPD’s Norfolk LEED Gold facility that began generating energy in August 2010. It’s called the SunCarrier photovoltaic system. The solar panels were made in Malaysia and the rotating frame, which is programmed to automatically reset each day to the orientation of the rising sun, was fabricated by Behlen Manufacturing Company. Project: Located on a 13-acre tract, Omaha Public Power District’s Service Center at 5520 Lindbergh Drive boasts a 60-kilowatt array of solar panels, a 1.2-kilowatt vertical-axis wind turbine, and LED yard lighting. For its many innovative features, the Center was awarded Leadership in Energy and Environmental Design (LEED) Platinum designation. Additional sustainability features include daylight harvesting, ground loop heat exchange, operational windows, occupancy sensors, white roofing material, use of recycled materials, water saving plumbing fixtures, pervious pavement, natural ground cover, storm water retention area, storm sewer inserts to mitigate oil spill threat—and more! OPPD incorporated these sustainability features to demonstrate their applicability, a benefit for customers interested in applying them in their homes and businesses. Project: 600-kilowatt solar array on the Pandorf Land & Cattle Company Ranch in Custer County, northwest of Callaway. The solar array is estimated to generate sufficient electricity to power 60 homes or 10 to 12 center-pivot irrigation systems. 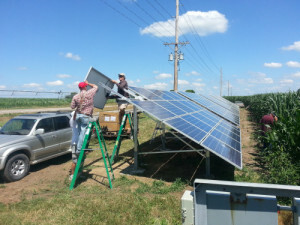 The project was partially funded by a USDA Renewable Energy for America Program (REAP) grant. Project: 23.5-killowatt photovoltaic system installed in April 2015 on the Tribal Police & Fire Department Building in the Village of Winnebago in Northeast Nebraska. Project: 25-kilowatt solar system. 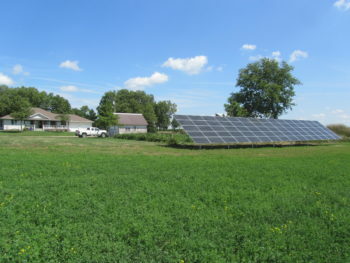 USDA Rural Energy for America Program (REAP] grant award winner. 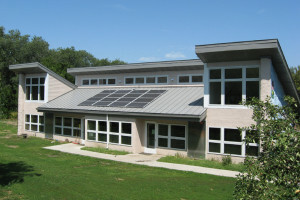 Project: Prairie Hill’s Renewable Energy Education Center features straw bale construction, passive solar and photovoltaic panels, energy monitoring equipment, a 10 kW wind turbine, low voltage light fixtures, recycled denim insulation, rain collection, and low-flow toilets. QuikByke is a start-up electric bike rental company headquartered in Omaha. 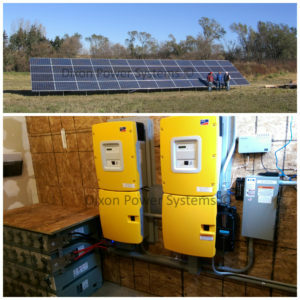 Dixon Power Systems is responsible for the design and installation of the solar array, batteries and energy management system. The entire container is energy independent from the utility grid and is solely dependent on the solar array and battery system. Everything from charging the bikes, interior lighting, computer kiosk, and Wi-Fi network is powered from the sun! 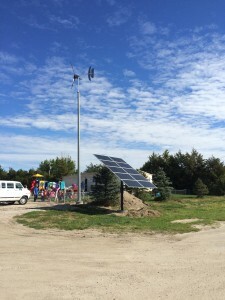 Project: Nebraska’s first solar and wind hybrid project installed at a public school. 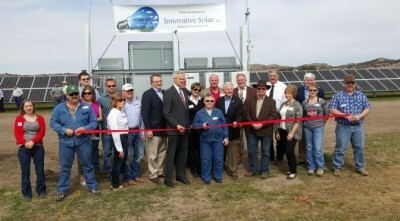 Scottsbluff’s First SunWise Community Solar Project: Mesner Development Company and GenPro Energy Solutions, both based in Central City, and Nebraska Public Power District developed the project. 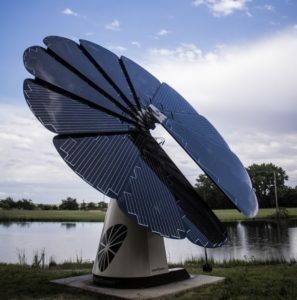 The SmartFlower is an all-in-one solar system. The petals open at morning and follow the sun on its path across the sky. They close up at night or if Nebraska winds get too gusty, reopening when they die down. The system is 40% more efficient in energy production than traditional solar. The SmartFlower generates 5.5 Mwh of energy per year. The SmartFlower in the above photo is located at Timberlake Ranch Campus, a Christian family camp at 2709 North S Road, Marquette, Nebraska. A second SmartFlower was installed at the Nebraska Christian School, 1847 Inskip Avenue in Central City, Nebraska. Interconnection Systems, Inc. based in Central City installed both systems. 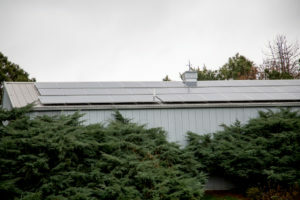 Article: Do Solar Panels Work on a Cloudy Day? 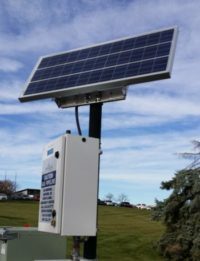 Project: The first solar-powered charging bench purchased by Lincoln Electric System with the savings from customers opting into the utility’s paperless billing campaign. Installed on the playground at Holmes Park, on the north side of the lake, the bench’s four mobile charging stations have four AC outlets and 24 USB ports. Park visitors can charge their laptops, cellphones and other electronic devices at this solar installation. Another portion of the savings from LES’ paperless billing initiative will be used to plant more trees in Lincoln’s public parks. Project: This residential project involved building a solar pergola consisting of fifteen LG solar panels with integrated Enphase IQ6+ microinverters (LG-330E1C-A5). The 4.35-kilowatt system is grid tied and serves to both generate electricity for the residence and provide shade for the south-facing deck. Project: 2.3-megawatt array (1,200 panels) located on a 21-acre solar park south of the city, alongside C Avenue. The array generates enough energy to provide 5% of South Sioux City’s electrical needs. This is the first Nebraska project for California-based developer Solar City, a Tesla Motors subsidiary. 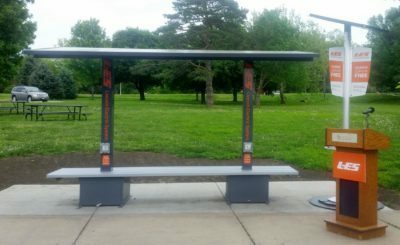 Project: Off-grid, 24-volt DC solar system installed on a bus shelter in downtown Lincoln, near the University of Nebraska-Lincoln. It powers the bus stop’s LED message boards that provide route time information to passengers. 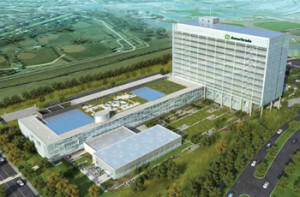 News Story: TD Ameritrade Calls New LEED Platinum Headquarters, Home, Green Building News . Project: J-Tech Solar collaborated with SWT Energy on this nearly 300-kilowatt photovoltaic system on top of the former Meadow Gold Dairy House at Seventh and M Streets in Lincoln’s historic Haymarket. 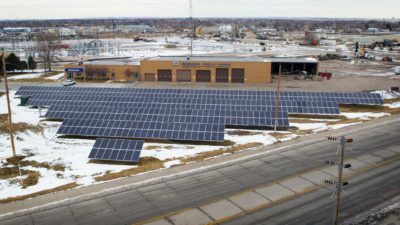 The business complex is now owned by Telesis, Inc. With 940 solar panels, the array is one of the largest privately-owned solar projects in Nebraska. J-Tech’s thirteen-member installation crew worked closely with restoration contractors to integrate the system into existing and historical structures. Federal tax incentives, rebates from Lincoln Electric System and the steady rise in the cost of electricity were driving factors in the owner’s decision to complete such a large project. Also, the price of solar systems has decreased more than 70% since 2009. 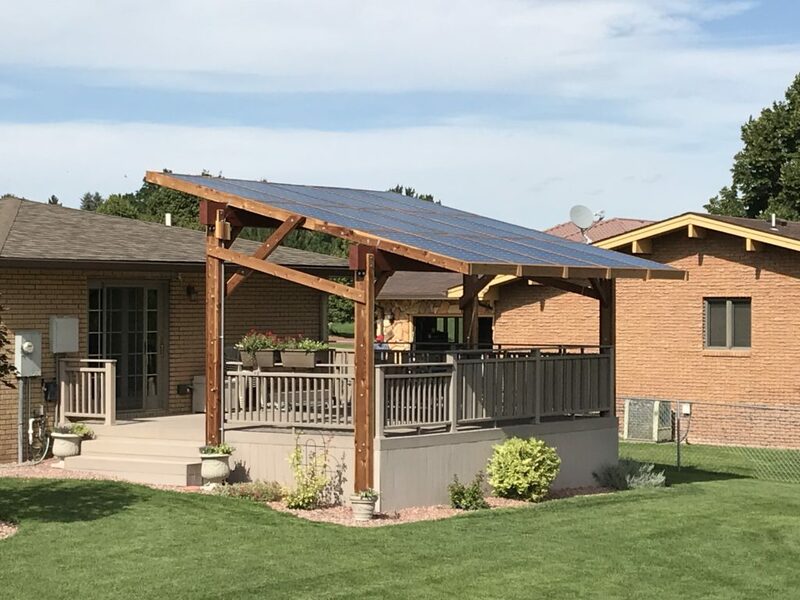 Lincoln-based GRNE Solar teamed up with Wilderness Construction to build this net-zero energy home, with solar on the roof and outlets for electric vehicles in the garage. The home, called the Sun Haven, is located at 6077 Chartwell Lane in Lincoln. Through the use of solar power this home will produce as much energy as it consumes. 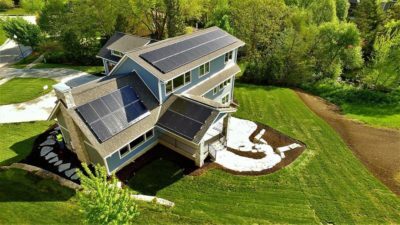 GRNE Solar featured the home on the 2018 Home Builders Association of Lincoln’s Spring Parade of Homes and hosted educational sessions on solar energy, as well as free “Solar Potential” studies for home buyers. 30 solar panels installed on the workshop roof. 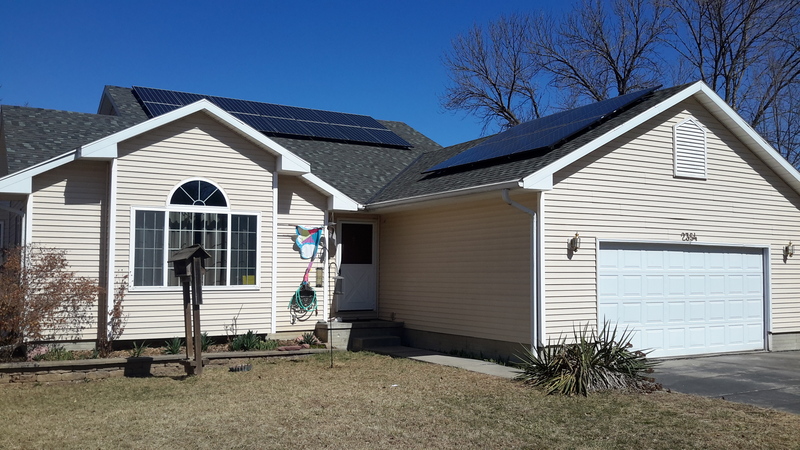 Tim and Pam, who are retired educators, became the first Hastings Utilities customers to take advantage of LB 436, which allows participants to connect co-generation installations. 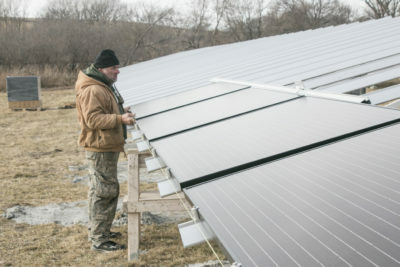 They plan to install 30 more solar panels this year. Project: 2.7-kilowatt, 10-panel, pole-mounted photovoltaic system, net metered, to offset his power costs. 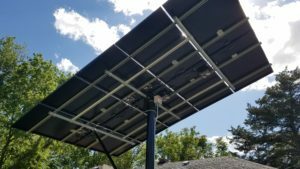 The array consists of eight Axitec 280-watt poly panels and two 250-watt Renogy poly panels, and five APSystems yc500i microinverters. Solar system’s angle is adjustable. 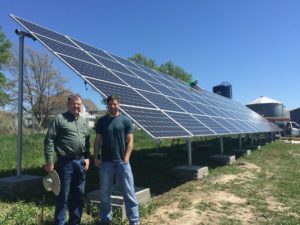 Installers: Tony and his employer, owner of Salt Valley Electric Inc.
Project: 5.3-kilowatt dual-axis solar tracking photovoltaic system at Total Manufacturing Company (TMCO) in the Haymarket District, was funded in part by Lincoln Electric System’s sustainable energy program. Project: 25-kilowatt (100 panels) south-facing solar array. The church has also installed a geothermal heating and cooling system, energy efficient lighting and a number of other energy and water conservation features.